Dr Terry Tan is currently an ENT consultant at the Otolaryngology Head and Neck Surgery in Khoo Teck Puat Hospital, Singapore. He has an interest in sleep surgery and runs the sleep subspecialty service in KPTH. He was awarded the ministry's HMDP (Healthcare Manpower Development Program) in 2017 and went to UPMC (University of Pittsburgh Medical Centre) in Pennsylvania, USA, under the mentorship of Dr Ryan Soose to deepen his knowledge in sleep medicine and surgery, with focus on hypoglossal nerve upper airway stimulation therapy for obstructive sleep apnea. 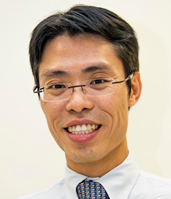 He is also actively involved in education and hospital activities, being a Clinical Lecturer with the Yong Loo Lin School of Medicine, and lead Clinical Teacher for ENT in KTPH for the Lee Kong Chian School of Medicine.​ He is also the ENT planning lead for the future Woodlands Health Campus.